We just had our floor tile and grout professionally cleaned by Coconut Cleaning Co. and it seemed like the perfect time to get some fresh photos of our home. I am also sharing the sources for all of our kitchen lighting, paint, and decor. So keep reading! Our home is a work in progress… I have so many ideas for decorating projects, and not enough time to do them all! The biggest project that has slipped through the cracks is picking out a kitchen backsplash and getting it installed. We’ve been here a little over a year… ooops! Part of the problem is that my husband and I don’t exactly agree on what we want. Hmmmm so to Pinterest we go for some inspiration! When you walk into our kitchen, this is the center and left side of the kitchen. Here is the right side of the kitchen area. So, we need backsplash on three walls. The left wall where the kitchen sink is, the back (main) wall where the stove is, and this long side wall of cabinets. 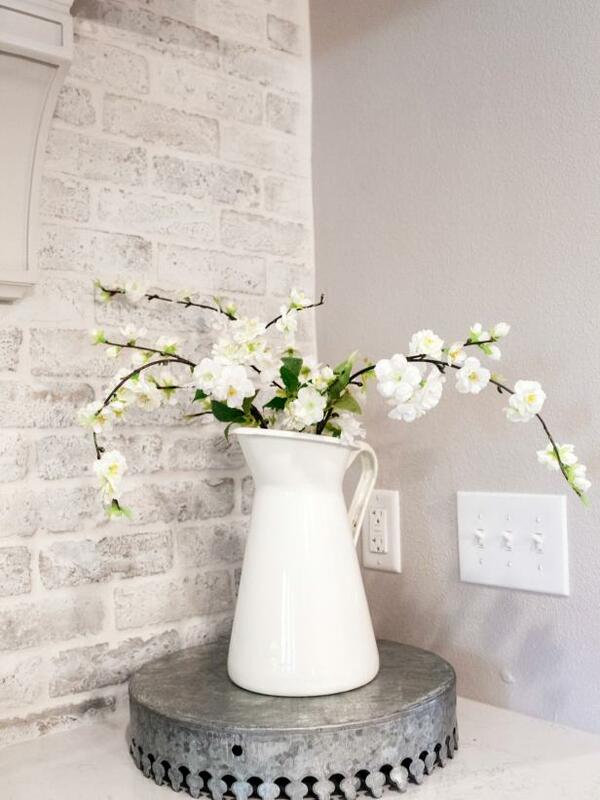 I’m just gonna throw it out there… I like plain white subway tile. With either white or dark grey grout. I think the white tiles are classic and will help all the white wall outlets blend in. Hubby thinks the kitchen is already too “white” to have a white backsplash. I’m open to ideas, so here are a few favorite ideas from Pinterest. 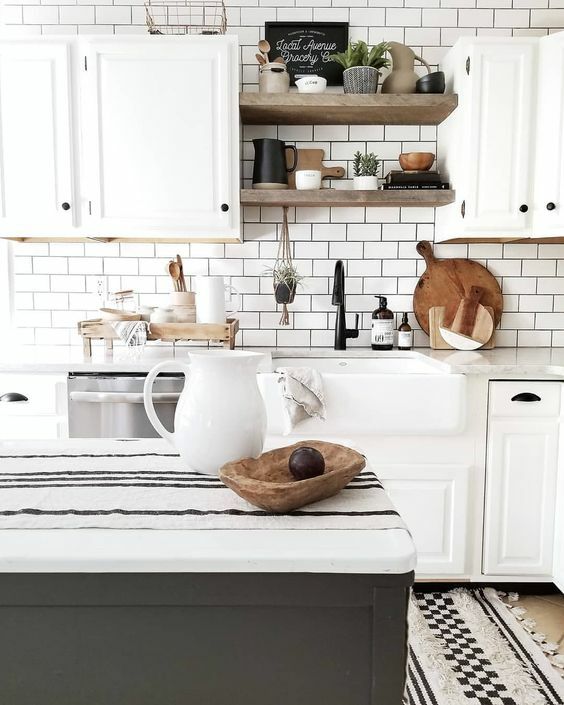 White subway tile with dark grey (or is it black?) grout. 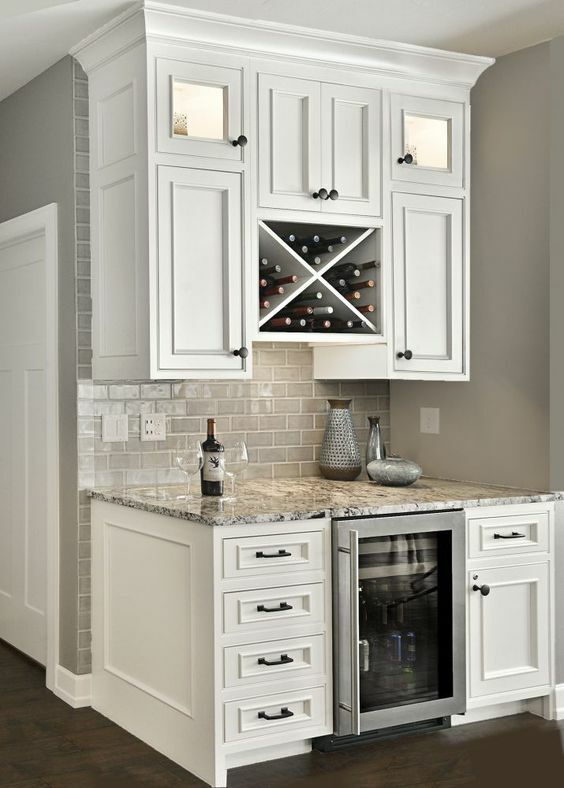 This kitchen has white cabinets with dark hardware like ours, and added wood textures. I think this would look great in our kitchen for a very classic/farmhouse style. One more look at the same kitchen! I love the black & white decor like we have in our kitchen. 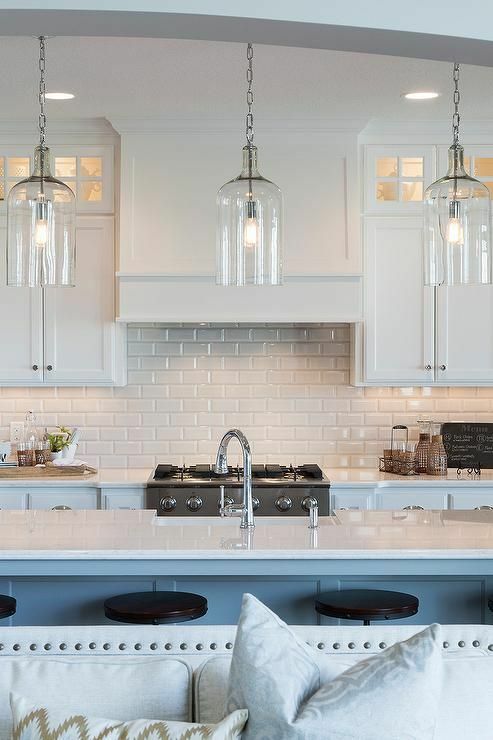 Here is another gorgeous kitchen with white subway tile and dark grout. Love. Another peek at the same kitchen. 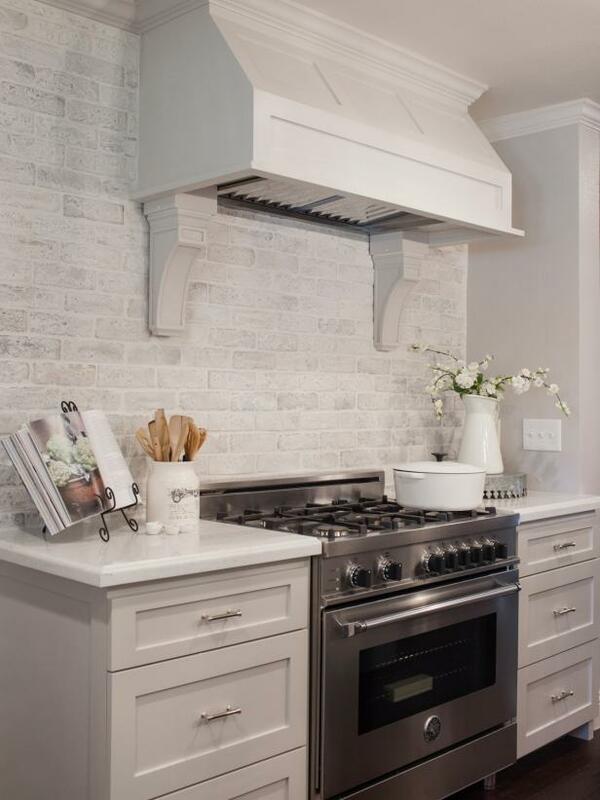 If this distressed white brick backsplash exists, I need to find it. This *may* be my favorite option. But might still be a little too “white” for our kitchen. 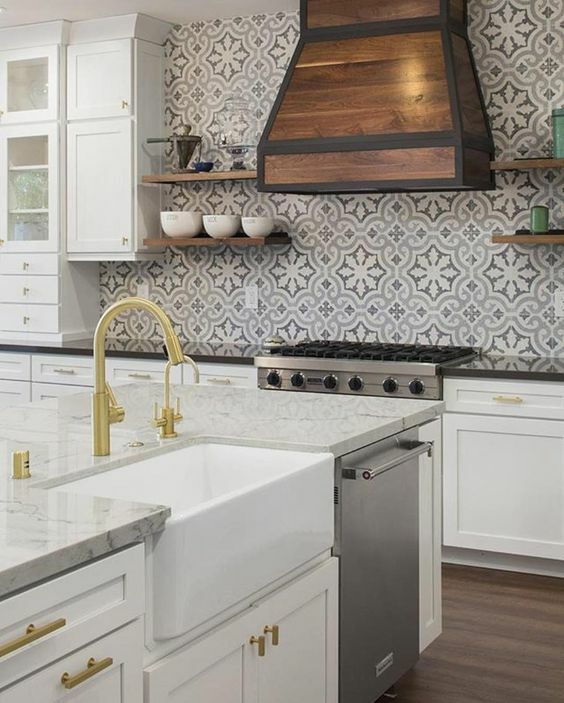 This kitchen was done by Chip & Joanna Gaines. So of course it is PERFECTION. Here is a close-up look at the brick backsplash. Here is a darker brick backsplash that appears to have grey tones in it. 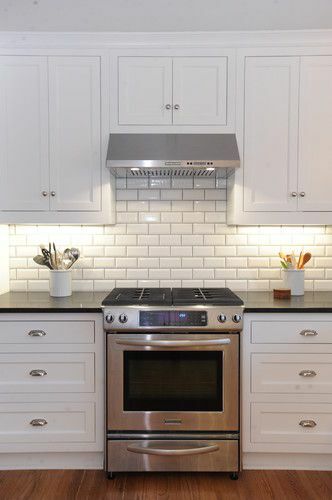 And here is white beveled subway tile with grey grout. Smoky Grey subway tile. This could be pretty! Sooooo which type of backsplash do you like best for our kitchen?! Leave a comment and cast your vote! I also wanted to share the sources we have used in the kitchen so far, from the paint color to the lights, to the countertops and the decorations. Just in case you see something you like! For starters, the paint color in our house is Repose Gray by Sherwin Williams. I am used to it now, but when we first painted I thought it was too “gray” and kinda wished we had gone with Agreeable Gray, which has slightly more beige in it (“greige”). Our countertops are white river granite. It is an attractive white countertop… but if we could do it over again, we would pay more and get quartz that looks like marble. The white river granite is very porous and doesn’t seal well (ie water seeps in rather than beading on the surface, even after we sealed it). It also chips and cracks easily. Literally… I banged a heavy glass plate on the edge of the counter by accident and the granite chipped but the plate didn’t. Another view of this rustic farmhouse chandelier over our kitchen table. Our floors are a wood-look tile. I don’t know the name of it off the top of my head, but if you are interested let me know and I can probably find it in the documents from our home build. This geometric black & white rug with tassels was a recent purchase from Target, and it’s perfect! Also… see that round rustic lazy susan to the right of the stove top? It’s such a convenient way to store some of the essentials we cook with every day (olive oil, balsamic, avocado oil, salt, pepper) in a non-cluttered maner. Also I have to give a shout-out to my favorite appliance, seen in the pic above. My Keurig K475 brewer. I looove this sandy beige color (rather than black and silver) and it seems to be so rare now, I can only find it on this site. If you are in the market for a new Keurig, I highly recommend this one! These shelves are to the left of the kitchen sink, and I just love this little vignette! The shelves have a rustic unfinished edge, although you can’t exactly tell from this angle. We have the 2′ long shelves, and these black shelf brackets. Don’t you just love the copper moscow mule mugs?! I searched high and low for a good deal on GOOD QUALITY ones, and decided on these ones. The black metal bar and hooks are from Ikea (as well as the little plants and silver containers), and the hand-painted signs are from an adorable local shop: Jaxn Blvd (yes, they ship!). The wooden rustic wine riddling rack is such a unique piece. I got it for a deal on OneKingsLane years ago… but you can get the same (or similar) one here or here. Thanks for touring our kitchen! Hopefully I will have updated pics with backsplash in the near future! Leave a comment if you have any other questions about the kitchen! 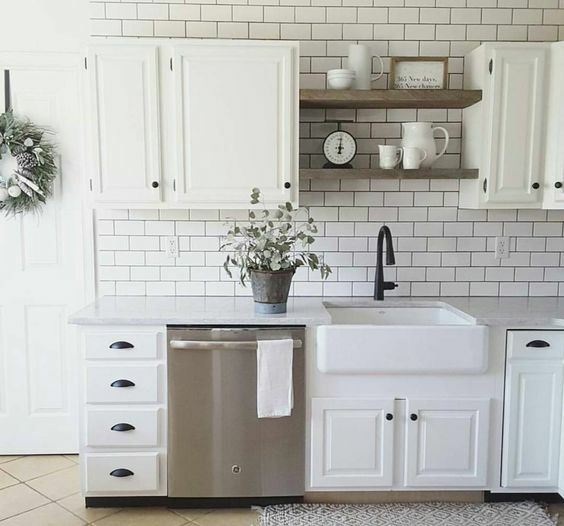 I love the Beveled edge white subway tiles with white grout. it’s classic. Thanks Andrea! I agree, it’s so pretty and classic! I like that the beveled edge adds some dimension. Thanks for reading the blog and for your feedback! ❤ I'm still undecided but need to figure out the backsplash ASAP!